This Vegetarian Lemon Rice Soup recipe is my most popular soup recipe! It's warm and comforting but also a vegan nutrition-rich meal you'll love to cook and eat often! 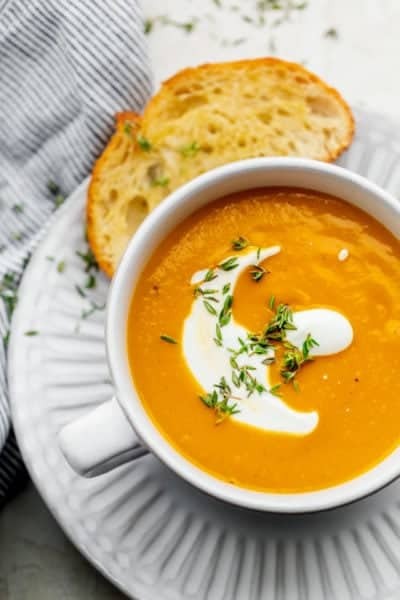 When the weather gets colder, there’s nothing like a warm hearty bowl of soup to satisfy your hunger and make you feel good all around! This Vegetarian Lemon Rice Soup is one of those comforting soup recipes that’s so easy to make, loaded with vegetables and keeps you feeling full and satiated. You can easily make it with very simple ingredients that you probably already have in your fridge! If you’re dieting in the new year, whatever diet you’re following probably has some soup suggestions for you. 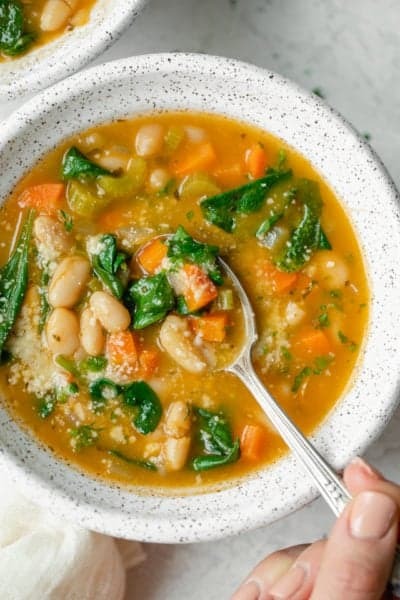 And you’re probably thinking that soups for weight loss might just be another common factor of fad diets. But it is so for a reason…it works! I’m not a dietitian. But I know the contents that go into the soup recipes I make. And I know how full I feel after a serving of soup, whether it’s the main meal or a precursor to dinner. The truth is the composition of soup is mostly liquid. That helps you feel fuller faster, thereby reducing your appetite for more food or reducing your caloric intake all together. And when you load that soup up with vegetables, it’s a win/win situation! Now, it can’t just be broth and vegetables, because it’s just not yummy or sustainable. Instead load it up with vegetables and add a zing of flavor that makes you want more, like in my Lemon Rice Soup. The zing in the Lemon Rice Soup is the lemon. The lemon is very refreshing and an appetite stimulant (hello diet-friendly soup! ), making that zucchini, carrots and celery taste even better. Start with 4 simple everyday ingredients: onions, carrots, celery and frozen garlic. Then, cook the vegetables with olive oil, salt and pepper until they slightly soften. Next, add the seasoning and the broth and the zucchini with a couple bay leaves. And then add the short grain white rice to the broth. Bring to a boil and simmer for 20 minutes until the rice gets tender and fluffy. If you prefer, you can use brown rice, or you can even make this grain-free by using potatoes instead. If you’re looking for low carb or a keto-friendly solution, I recommend adding yellow squash and/or cauliflower rice. It will make it more hearty and filling. The best part of this recipe is that it’s vegetarian – well, vegan actually – and it uses simple everyday ingredients you can easily throw in a pot to make the recipe. What I like to do is make a huge pot and enjoy it for lunch 3 times during the week and freeze the rest for a mighty snowy day! Cook it quicker by using leftover rice and reduce the simmer time to only 10 minutes. Use your own vegetable broth. 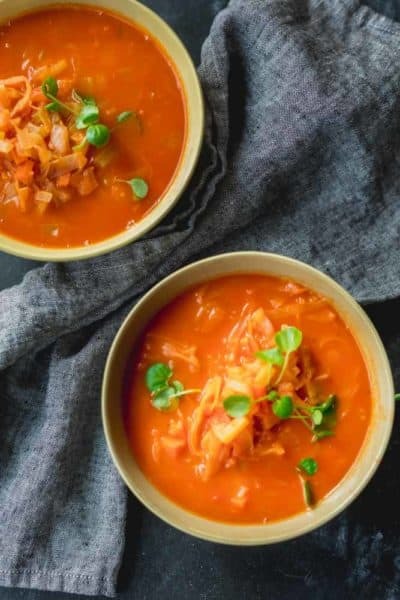 To make homemade vegetable broth, just place the vegetable scraps of the outer layers of the carrots and onions, and the end pieces of the celery along with bay leaves and other herbs in a pot. As much water as you want and cook it together for 30 minutes. Make it grain-free by using chopped potatoes instead of rice. If you’re looking for a Whole30 soup, switching the rice for potatoes is the perfect substitution. To make it low-carb or keto-friendly, you can add chopped yellow squash and/or riced cauliflower. Don’t add the lemon juice until you’re done cooking. You might be tempted to just throw everything in a pot at once. But definitely wait on the lemon juice until the soup is cooked to avoid any bitter taste of the lemon juice simmering for too long. If you’ve tried this healthy-ish feel good Vegetarian Lemon Rice Soup recipe or any other recipe on FeelGoodFoodie, then don’t forget to rate the recipe and leave me a comment below! I would love to hear about your experience making it. And if you snapped some shots of it, share it with me on Instagram so I can repost on my stories! Add the oregano, salt and pepper and stir. Pour the vegetable broth and water and bring to a boil. Stir in the zucchini, rice and bay leaf. Reduce heat to a low simmer and cook covered for 20 minutes until rice is fluffy and cooked through. Reduce heat to low and stir in as much of the lemon juice as you'd like. If you don't have oregano, feel free to use thyme, parsley, cilantro or other herbs. Hi Sabrina – Yes you can definitely use quinoa instead of rice! Hope you like it! And here’s a link to my chicken broth! I haven’t rated yet as still cooking. In written recipe you need to add to cover the soup. I had to watch video as I thought it would be covered. I also was using brown rice which needs to cook for 45. Minutes so switched to a rice blend I had that cooked faster. I am sure it will be delicious, especially with my fresh myer lemons. Thanks. I hope you liked it Chris! And I added that part to the instructions. Thank you!